You are going to Watch One Piece Episode 437 English dubbed online free episodes with HQ / high quality. Stream Anime One Piece Episode 437 Online English dub For His Friend! Bon Clay Goes to the Deadly Rescue! 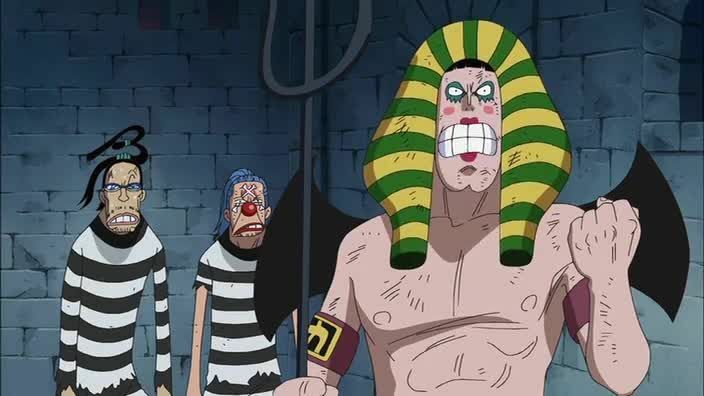 After Luffy’s defeat, Magellan has him imprisoned in Level 5 until the poison kills him. Mr. 2, having taken Hannyabal’s appearance, resolves to rescue Luffy in order to make up for abandoning him in the fight with Magellan, but learns that no antidotes can save him now. Mr. 2 then decides to seek out Emporio Ivankov, Queen of Kamabakka Kingdom, to heal Luffy, but learns that he has vanished in one of the “demoning away” incidents. Mr. 2 heads to Level 5 with Buggy and Mr. 3, who quickly abandon him when the Wolf Unit attack. Luffy remains determined to rescue Ace despite his condition, and Mr. 2 arrives at his cell to save him.